This modest chapelry in the eastern part of the parish of Westbourne should not be confused with the parish church of the same name outside Henfield. 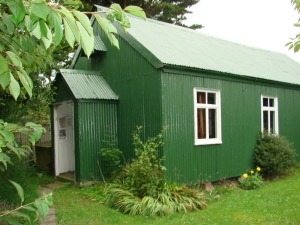 This one belongs to the dwindling number of small corrugated iron buildings (‘tin tabernacles’) and has a small west porch. It is painted dark green and its windows are indistinguishable from those of a house. Iron churches were mostly late C19 or early C20, but the date of this one is not recorded. It is not mentioned in volume 4 of the VCH (published in 1953), which normally records at least the existence of chapelries of this kind, so if it was opened here after that time, it must have been acquired second hand, which was not unusual since such buildings were often sold when they were replaced by more permanent structures.